After we arrived in Austin on Saturday, a couple of us stayed at the hotel and used the time to get some work done, while Makayla–who had never been to Austin–used the time to explore Austin and its grounds. She posed for photos, while also exploring the art exhibit on gun violence in the Capitol Building. After a bit of downtime, we met Ilexus and Jezel, the two LEAP Ambassadors currently interning in Austin, and we decided on dinner at CAVA, a Mediterranean restaurant with build-your-own grain bowls, pitas, and salads. Everyone was able to find something they liked there, while also trying something different. The black lentils and falafel were especially delicious additions to our bowls, and we were also able to sample the interesting-sounding beet lemonade that proved to be quite refreshing. After dinner at CAVA, we stopped by The Coffeehouse at Caroline Restaurant for a pick-me-up and also to have something to warm our hands on during the chilly walk back to the hotel. We got a little experimental and tried matcha green tee lattes, white blueberry teas, while other, less-adventurous folks settled for their white mochas. Armed with these refreshments, we made our way back to our hotel, to commence a “retreat,” where we planned not only for the remainder of our trip, but also for the semester. On day 2 of our Austin trip, an even more exciting adventure awaited. Deep in the heart of Austin, lies a monumental building that every Austinian knows. On a normal day in Austin, you can see the Capitol building from almost anywhere in the City. However, today was not one of those days. We walked through downtown Austin, in the dense fog, to get to our Austin Capitol where our legislators make laws. For those in our party who had previously worked in the Capitol, they experienced a sense of nostalgia; for the rest of us, it was more a sense of wonder. In the middle of the rotunda, we looked up to look up at the star centered in the middle of the dome, and we thought of our own dreams. Our first stop was Senator Charles Schwertner’s office, where we met Deandra Porter, who is the scheduler for the office. Ms. Porter explained to us how the Senator’s office was run. She engaged us in conversations of how a Senator’s office would be like throughout session and stressed the point that no matter how busy they are in the office, anyone who comes through their door with a problem must be assisted immediately, including a kindergarten class touring the capitol for the first time. Soon after we met with Chris, our tour guide. Before taking our tour, we made a quick pit stop to see the painting of our beloved Sam Houston. …and even go up to the Speaker’s Dias in the House, where we could see a wonderful portrait of Sam Houston. To continue our Sam Houston theme, we also went to the entrance, where we posed with Elizabet Ney’s sculpture of General Houston. After finishing our tour, we met with Scott Jenkines, who is the chief of staff for State Representative Armando Martinez. Mr. Jenkines gave great advice on what he looks for in interns and gave great advice on what skills to hone such as to be inquisitive, take the initiative, and being prompt. After captivating us with stories of the Capitol and his experience with the internships, Mr. Jenkines turned to the students for questions. Everyone was curious about the various aspects of the internship, and Mr. Jenkines and Beatriz enlightened us with their experiences. Following an interesting and enlightening morning, we headed to one of our favorite Austin restaurants: The Clay Pit. The Ambassadors and friends visited their favorite restaurants in Austin this week! Sawyer, Ilexus, and Tyara had never been to the contemporary Indian restaurant, The Clay Pit. It is in the historical “Bertram building” in beautiful downtown Austin. They are locally owned and have been open since Austin was just starting to form into the city it is today. As we arrived, we were happy to find out that they had a lunch buffet on the menu, so we decided it was the best way to try an assortment of foods. As we went around the table talking about some of our favorites, the consensus winner being the chicken tikka masala, we also talked lengthily about our trip. It was a great way to show our new friends a new type of food! We hoped to visit the Blanton Museum of Art on Thursday, our first day in Austin, but the Museum was unexpectedly closed for a private reservation. Thus, we shuffled our day trip around, and we stopped by again today. Upon entering, we were greeted by a grand foyer with walls decorated with intricate tiling on the marble walls with varying shades of blues. Inside the exhibit were beautiful displays of minimalism coupled with descriptions and explanations detailing the inspirations behind each piece. The exhibit snaked around through totems made of redwood and color spectrums until we reached the foyer again. …and European Art however we spent the most time in the American/Contemporary section of the gallery. Here, we quizzed each other on who could guess the famous artist behind the paintings and pieces. Among these were Warhol, Lichtenstein, and Rivera. Towards the end was a room which contained one singular structure sitting in the middle of the room. It looked like a raised tent with transparent mesh walls with thousands of pennies on the floor inside. It took us a second to realize, but the roof of the tent was made of bones and there was a stack of Catholic communal bread attaching the penny floor to the bone roof. This was symbolic of the early colonialization of Native Americans by the Europeans who wiped out the population during their settlement in search of wealth. I think we all left that display feeling like we had earned a new respect for abstract art. We sauntered about the rest of the exhibit admiring sculptures and culturally innovative art styles until we, once again, were led back to the foyer, where we made a final stop to once again experience the colorful art of Ellsworth Kelly. But our Ellsworth Kelly wasn’t over! We made another stop in the “Austin” Chapel, where we had a chance to experience the beautiful stained glass windows with actual sunlight shining in. …and it formed a nice image for us to impress in our minds as we planned to depart Austin. This is where our journey of the Blanton Art Museum ended, as well as our Austin adventure, as we headed back home before embarking on our next quest of learning, art, history, & literature. A Capital Day in Austin! With SHSU gearing up for finals, the LEAP students didn’t spend a full day in Austin, but with help from veteran LEAP Ambassadors, they made the most of the time they had. 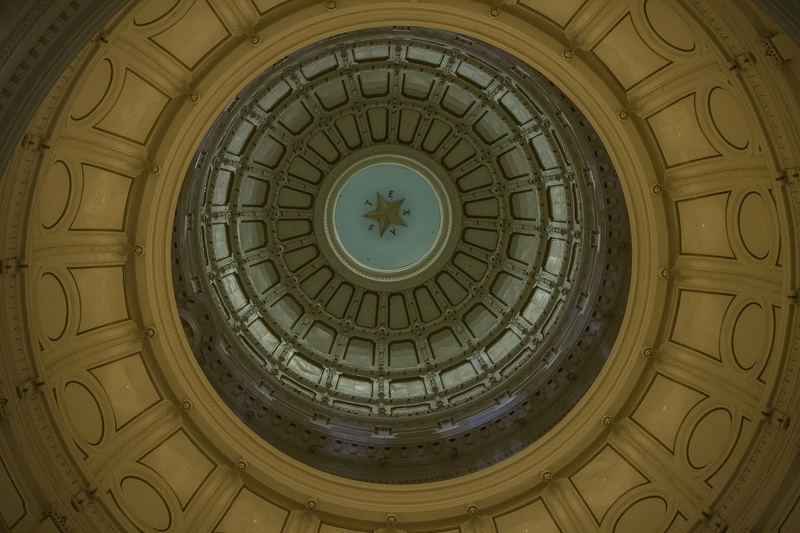 Following a late night (blogs submitted at 1:38am), Megan Chapa, Staci Antu, and Jennifer Holton awoke early to manage visits to the TX Capitol and the LBJ Presidential Library. has doors so heavy that 17.5 pound door hinges are required. Of course, a highlight was the “whispering gallery” in the rotunda, where you can stand, speak, and hear your own instantaneous echo. We also saw the old Texas Supreme Court building, a small room in the Capitol! It’s really no wonder they moved. It wasn’t all fun and games. Christina Perez, intern for Rep. Jim Murphy, led us on a tour of the Capitol building, where we learned a lot and had some fun, too! Part of the fun was visiting the offices of the interns with whom we shared dinner the night before. It was a great chance to see their work environment, learning more about how things work, and seeing their passion for their job. 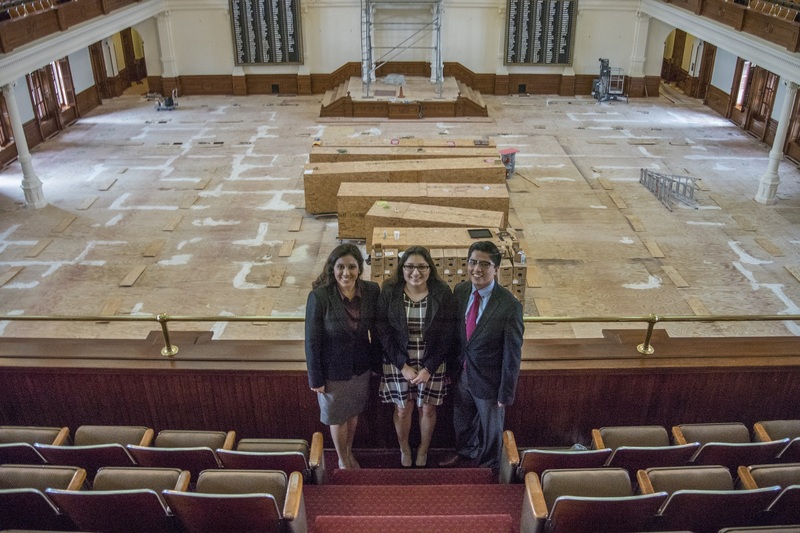 Alex Galvan, Brian Aldaco (who showed off his fancy lobbyist-provided calculator), and Karla Rosales served as office guides. We’re not sure, but we think Megan’s repeated winking at the Marshal may have encouraged him to let us break the rules a bit. 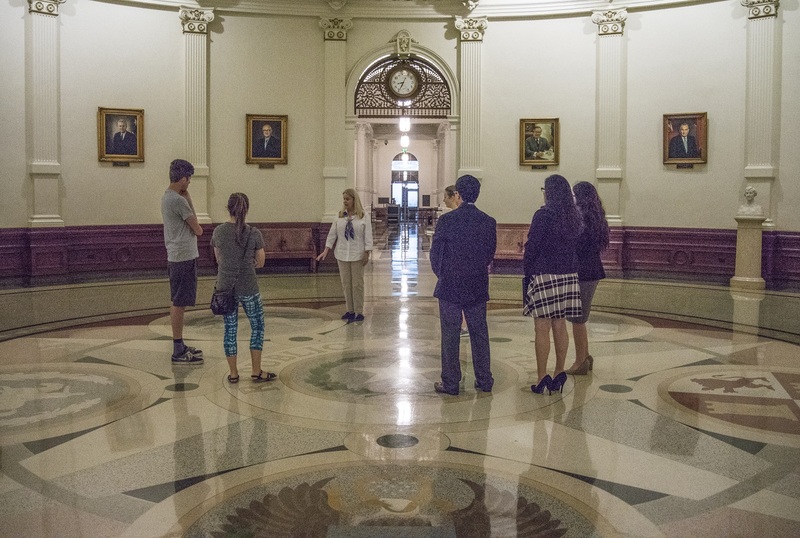 Although it was a short visit, it was a nice counterpart to our previous evening’s stroll around the capitol grounds, and we really appreciate Christina and the other Austin Interns/LEAP Ambassadors providing support of our tour. 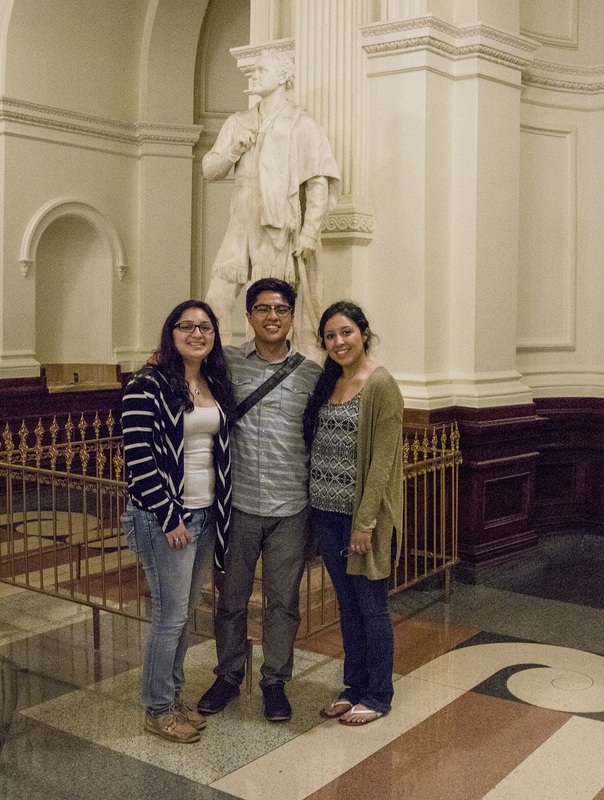 Although Megan was a veteran of the state capitol and Staci had visited previously, it was Jennifer’s first time, and a great way to experience her first visit to the Texas Legislature. Again, Megan was a veteran of the LBJ Presidential Library, and Presidential Libraries in general–she’s been to four–but it was Staci and Jennifer’s first time in a presidential library. It’s a lot more fun than it sounds! …and generally enjoyed the exhibits. …and this area was the highlight of the Museum. Or perhaps the most impressive aspect was being able to see how much he was able to accomplish in only five years, while also seeing the history that transpired during his life–from the advent of flight, WWI and WWII, the Civil Rights movement, and the moon landing. It was a great way to learn not only about LBJ, but also about the 20th century. It was also a beautiful day in Austin. To cap off the day, our trip, and interactions with some truly wonderful people–from Jeff Guinn and Stephen Harrigan to the Austin Interns–we captured some of Austin’s beauty and one of its most notable landmarks in a farewell photo outside of the Library. Author mikeyawnPosted on May 5, 2017 Format AsideCategories Civic Engagement, Civil Rights, Politics, TravelTags Austin, Austin Interns, Center for Law Engagement And Politics, LBJ Presidential Library, LEAP Ambassadors, LEAP Center, SHSU, Texas CapitolLeave a comment on A Capital Day in Austin! A group of a dozen SHSU interns spent the day in Austin in preparation for their internships. The students, 10 of whom will be stationed in Austin and two of whom will be in DC, posed for professional photos, explored international food, and enjoyed the rush of simulated skydiving. The morning temperatures hovered in the mid-20s for much of the photo-shoot. Although this didn’t stop the photo-shoot, it did lead to much self-pity. Nonetheless, much progress was made, with Paul Olle in charge of photographs (His photographs, which are much better than those here, will be posted later). For lunch, the students opted for Serbian fare offered at the wonderful Balkans Cafe and Grill. The staff at the restaurant are professional, and the food is great. More important, lunch was a chance for former Austin interns to join the current Austin interns for lunch and networking. 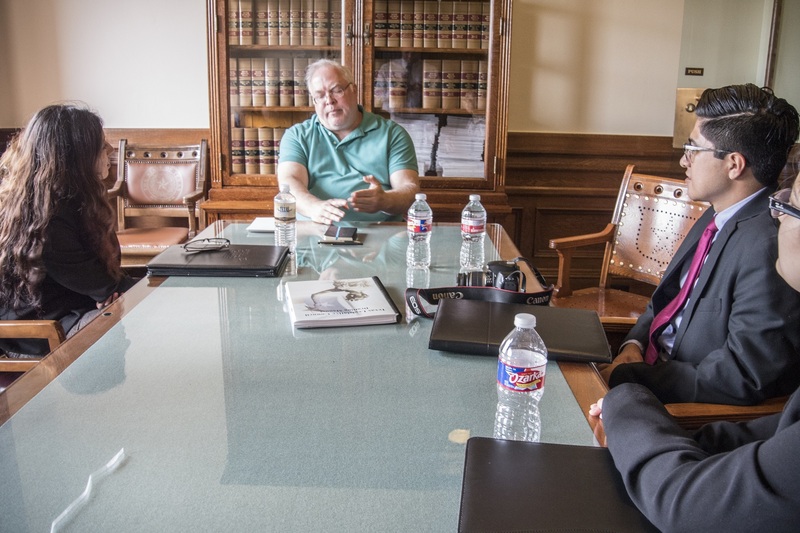 Of the eight SHSU students who interned at the Capittol building last session, five have been hired full-time for this session, and many of them joined this year’s group. It was also a great and rare opportunity for Professor Yawn to enjoy the company of multiple cohorts of students simultaneously. Of course, the most fun activity of the day was at iFLY, where students had the chance to “skydive” without any real chance of dying. Some took to it quicker than others (Spencer Copeland was an expert), but all did well. All of the students ended up signing on for the “High Fly,” which is when the instructor flies with the student flyer 20-30 feet into the tunnel. It is the most exciting part of the flight and also, interestingly, the easiest. The instructor does all the work! Of course, the real exhilaration will be the students’ experiences in Austin and Washington, DC this semester. Full of long days, interesting sites, and, we hope, bright futures. 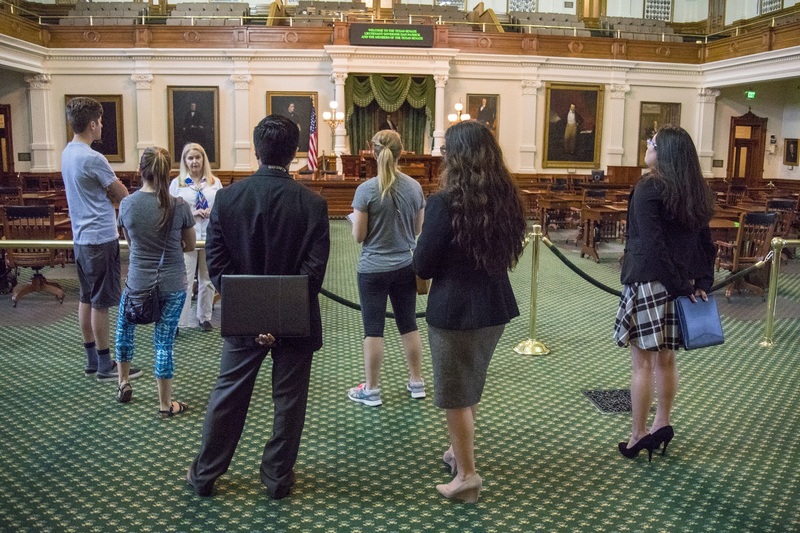 As has been SHSU’s tradition, every legislative session the LEAP Center finds exemplary students to intern at the capitol with the state legislators. 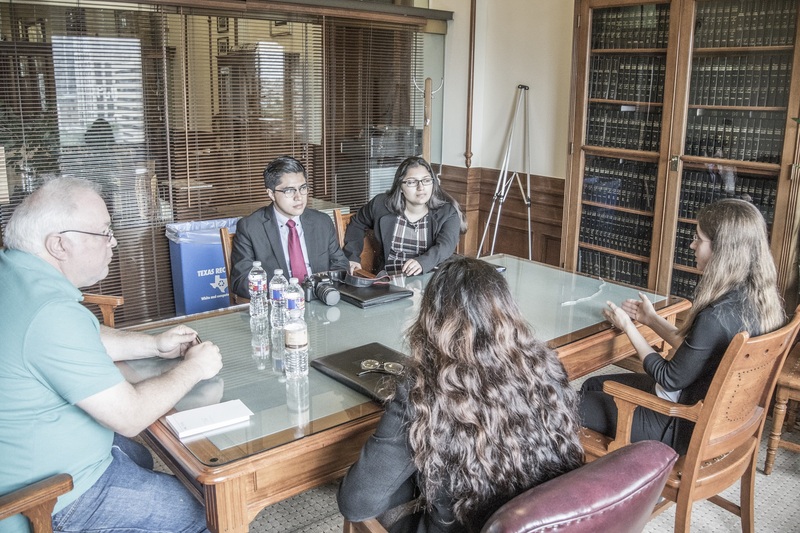 From a week of mid-terms to a weekend of new legislative terms, the LEAP students traveled to Austin to tour the capital, interview in legislative offices, and explore the rest of the city. It was six o’clock in the morning when we LEAPed out of bed, awaiting the opportunity of a life time. Donning our newly pressed suits, we eagerly anticipated the ride to the capitol, where we would interview with three staff members representing various legislative candidates. When we arrived at the front gates of the capitol we were struck with awe. Magnificent coal black gates surrounded a structure like no other in the state of Texas. The capitol, dressed with genuine Texas red granite and topped with the gorgeous guardian of liberty, was truly a testament to all the opportunities that Texas provides. Soon after the group arrived at the capitol, we interviewed staffers from numerous offices including: Benjamin Williams, Director of Administration for Representative Jim Murphy; Eiman Siddiqui, future chief of staff for Representative-elect Tom Oliverson; and Nick Raymond, future chief of staff for Representative-elect Ernest Bailes. The interviews were indeed a learning experience as potential Austin interns Vincent Melore, Christina Perez, and Isabela Gonzalez were interviewed simultaneously for their first interview of the morning. During the interview, the group was asked typical interview questions, hypothetical interview questions, and some questions that seemed unusual but were used to get an understanding of our unique personalities and whether or not they would fit well in their offices. As we continued interviewing throughout the day, we also toured through a few of the offices to gain a feel for the environment and expectations of each office (just in case we get placed). We soon understood how important it would be to maintain a professional and positive attitude. As the frontline of the representative’s office we would be responsible for ensuring the integrity and security of that office. Although we all knew we would be in for the workload of a lifetime, this in no way stifled our determination and drive to serve the legislature. Meanwhile, with a muggy and dull sky, LEAP students without impending interviews began their day differently. As we poured out of the van, we filed through the gates and paused as we took a moment to gaze up at the Texas State Capitol. “I’m going to go park. Will you see about getting a tour?” Professor Yawn said to Beatriz. She turned on her heels and began to lead the group towards the edifice that towered in front of them. The façade looked almost pink in contrast to the grey sky. The building was a beautiful example of the renaissance revival style. The walls were smooth, polished red marble. Columns surrounded the rotunda that rose high above the rest of the building, and all around it the pediments of each individual wing came to form four separate peaks. Some of the students had been here before, but we were all just as mesmerized by the ornate capitol details surrounding us. While waiting for the next tour to start we had time to admire the general splendor. The floor was terrazzo marble that somehow managed to gleam in what little light from outside had found its way in through the 900+ windows that functionally adorn the Capitol building. Professor Yawn eventually joined us and we followed the tour guide as he ushered us up wrought iron staircases, down hallways with more than twenty identical doorways, and past portraits of former Texas governors. and some were left to amuse themselves for the day. Eventually, we all made our way through the winding halls and tunnels of the capitol and regrouped at the Reference Library before going to lunch. After an adventurous morning at the capitol, we headed to Frank and Angie’s Pizzeria. The options for pizza pies seemed endless. The first suggestion was pepperoni, but we all decided that we should explore different options. After a vote across the table, we decided to order the “Chairman of the Board” which was Frank Sinatra’s nickname after he founded Reprise Records in 1960. We also decided to try “white pizza.” This take on pizza strays away from the path of familiarity for some of us as the tomato sauce is replaced with alfredo. In true Austin spirit, we embraced the change and decided to go for the strange. While enjoying the delicious pizza pies, with expressive eyes we discussed how we could see of the town. Eventually we figured out the best routes through the city that would take us through housing options for the spring. Tired of looking through countless apartment complexes, a bit weary from the costly Austin living, we found it apt to unwind with a visit to the ever favorite Clay Pit. From the Guadalupe St rumbling echoes of traffic, we crossed into the cozy, calm Indian cuisine restaurant. As we were seated, the spicy aromas which filled the air prompted us to get ready for this trip down savory lane. As their eyes met the different menu items, students who had never been to an Indian restaurant looked perplexed, perhaps even frightened. Items such as Goat Curry, Lamb Roganjosh, Boti Kabab, (whose pronunciation was just as ambiguous as its ingredients) were met with curiosity but ordered nonetheless. …we managed to get off our seats and take a night walk through UT Campus and the Capitol. We strolled through the city until we reached the UT Campus. 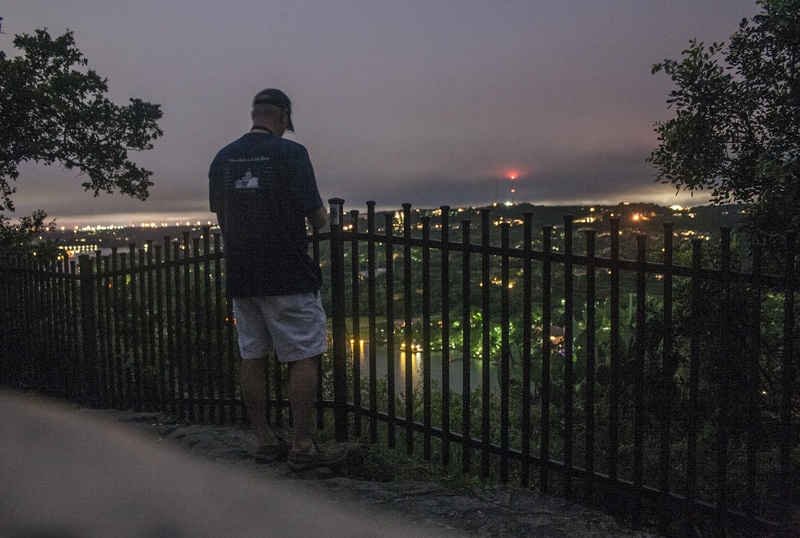 As we neared the glowing UT Tower, we surveyed the South lookout from our viewpoint. Standing on that pebbled ground we stayed contemplating at the bright vista of a very beautiful Texas Capitol dome. Night crawling through more of Austin we re-visited the State Capitol and pensively strolled down the perimeter of the legislative building. With a day full of weary and a tomorrow full of mystery, it was nice to walk worry free, soaking in the pleasant moon glow and shine from our Texas seal. Our little weekend adventure had come to its end. With a drive back to Huntsville in the morning, we took our last glances of the capitol, gave our last sighs, and agreed on how pleasant the day as a whole had been. Even though nerves ran high, and results are yet to be seen, at least we got to spend an adventurous day at Austin with great friends. Although my time at the Capitol has been short and passed too quickly, my experience has been extremely enriching thus far. On the fourth day of my week long internship, I walked into the Capitol eager to gain as many new experiences as possible. …I spent the first half of the work-week working in Senator Lois Kolkhorst’s office. Senator Kolkhorst’s office represents Senate District 18, however she used to represent Huntsville. 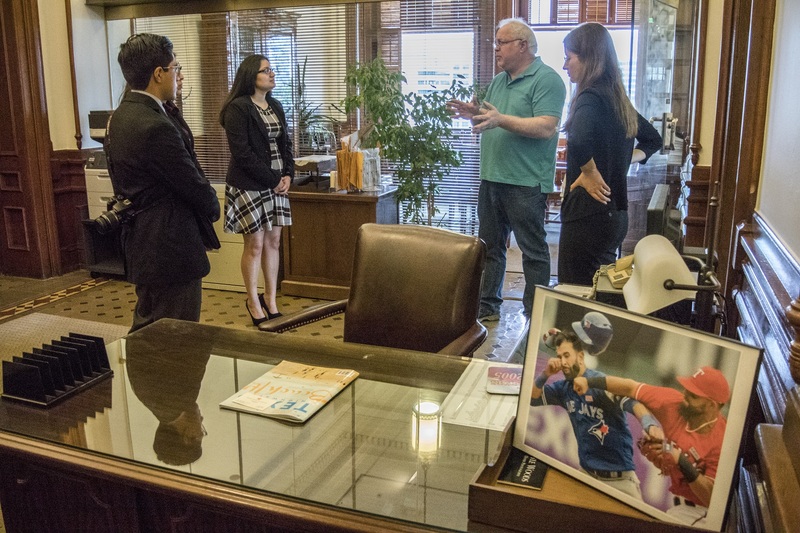 Senator Kolkhorst’s office was very welcoming and willing to teach me some of the tasks required by interns. I spent time answering the phone, talking with concerned constituents, and researching for the Policy Advisor and General Counsel. This research allowed me to learn more about policy issues I was previously unfamiliar with. Additionally, I helped prepare for the Senate Health and Human Services Committee meeting that was to take place later in the week by compiling a binder for Senator Kolkhorst, who is the vice chair of the committee. I am thankful to have had the opportunity to work in such a great Senate office! Today (Thursday), I worked in Senator Charles Schwertner’s office. When he isn’t at the Capitol during Session, Senator Schwertner works as an orthopedic surgeon. He represents Senate District 5, which ranges from Georgetown to Bryan to Huntsville and, of course, SHSU. Ariel Traub, former LEAP President, former Austin Intern for Senator Schwertner’s office, and currently a District Representative for Senator Schwertner, trained me as an intern for the week. Senator Schwertner is the Chair of the Health and Human Services Committee. Today was an exciting day for our office because the Health Committee met to hear testimony regarding potential issues to be addressed in the 85th Legislative Session. Ariel and I walked over to the Senate floor to observe the Committee meeting. Karla met us there and we were even allowed to sit on the Senate Floor like real staffers! We listened to the beginning procedures and the first testimony before heading back to the office. Although we did not stay for the entire committee hearing (it lasted over 7 hours! ), I still learned about the actions, responsibilities, and procedures of Senate Committees. I spent my afternoon learning bill analysis, constituent correspondence, and the Correspondence Management System (CMS), all of which are extremely important to a Senate office. Thankfully, I had a wonderful team to help explain the many intricacies of the office. At the end of the day, I was thankful to have spent time in Senator Schwertner’s office and was already looking forward to the next day! Just because our work day was finished, that didn’t mean our entire day was over! …visited the Blanton Museum of Art, enjoyed a delicious dinner at Kerby Lane Café, and finished the evening at Paramount Theatre watching Butch Cassidy and the Sundance Kid! The Blanton Museum of Art housed many beautiful art pieces in a variety of mediums. We were fortunate to arrive during a special exhibit of Francisco de Goya’s (1746-1828). …Goya’s work also expressed his belief in principles of progress, liberty, and tolerance during the Enlightenment. After enjoying the Goya exhibit, we transitioned upstairs where two pieces of Luis Jimenez were beautifully displayed. Both of his sculptures are made out of fiberglass and painted with automotive paint to give each piece a glossy shine. I respected his artwork because they depict the American West through a different perspective than a traditional painting or sculpture would. Also catching our eyes was the artwork of Cildo Meireles, Missao/Missoes (How to Build Cathedrals), which consisted of 2,000 bones and 600,000 pennies (all from the year 2005). There was also the work “Book from the Sky”, by Xu Bing, which featured some 4,000 invented characters to resemble the Chinese language in the form of printed documents on walls, floors, and, of course, from the sky. After enjoying the many works of art, we departed to Kerby Lane Café for dinner before our movie! 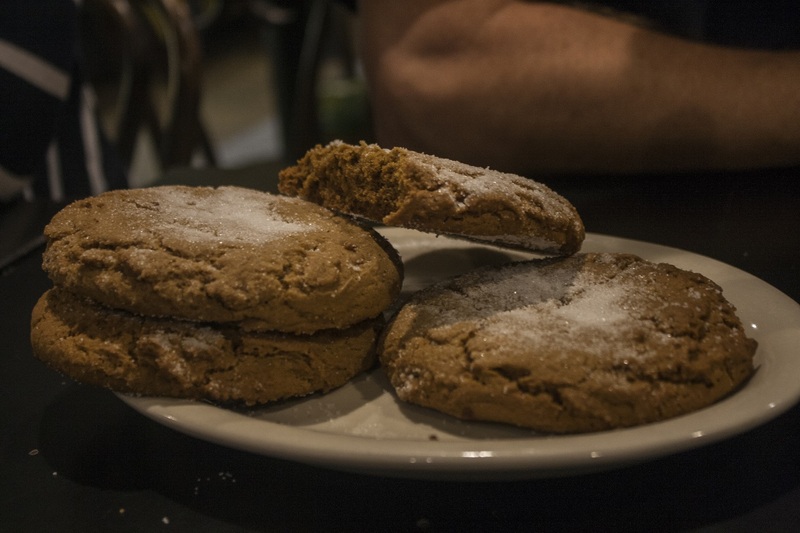 A short drive later, we arrived at Kerby Lane Café, just off the edge of UT’s Campus. I was excited to try Kerby Lane Café because I kept hearing great reviews. Kerby Lane did not disappoint! Known for so many excellent dishes, it was hard to pick one! I ate the Portobello omelet with home fries and fruit with warm apple pie for dessert. It was a delicious meal and just what we needed after a busy day at the Capitol! This was our favorite meal of the week thus far! More than a century old, Paramount Theatre’s beauty stands out on Congress Ave at night. As part of their Summer Classic Film Series, Paramount Theatre presented Butch Cassidy and the Sundance Kid. Paul Newman and Robert Redford starred in the classic Western movie. The movie is a classic for many reasons, some more obvious than others. For example, Professor Yawn explained that the movie was one of the first to incorporate a musical montage scene! Following the journey of western outlaws, the movie provided many laughs and was enjoyed by the LEAP Ambassadors! Upon conclusion of the film, we got a view of the upstairs of the theater. It was beautiful! But as the clock neared midnight, it was time to head back to the hotel to prepare for the final day of our mini-internship. Many thanks to Senator Kolkhorst and staff, Senator Schwertner and staff, the LEAP Center, and Professor Yawn for planning a week full of experiential learning! We had a dual-view day ahead of us, when we awoke. Our morning hours would be spent examining the governing side of Texas politics. Our afternoon and evening hours would be devoted to the campaigning side of Texas politics. Both were rewarding, and both informed and enriched our understanding of the other. We began with a tour of the Texas Capitol. Our tour guide was informative, providing us with a nice overview of the capitol while also highlighting interesting side features. In the Capitol’s rotunda, for example, visitors can stand in the center, speak, and hear an echo that those around them cannot hear. Or, did you know that the door hinges weight 7.5 pounds? These are just some of the interesting facts that a tour will provide. …where we saw the vivid paintings “Dawn at the Alamo” and “The Battle of San Jacinto,” both by Henry Arthur McArdle, who offered a heroic interpretation of the quest for Texas independence. Speaking of which, we showed our state pride by taking a photograph with the portrait of Sam Houston, who not only led troops to victory at San Jacinto, but went on to serve Texas as President, Senator, and Governor. We completed our capitol tour with a visit to the underground annex, where we admired the window view of Goddess of Liberty, which towers atop the capitol dome. Following a brief visit to the Capitol Grill—we would later be told, “don’t ever eat at the Capitol Grill, not ever—we journeyed the extension to find the office of SHSU Alumnus Representative Will Metcalf. There we met Chief of Staff Zachary Stephenson, who provided us with a rewarding presentation on working in the legislature. Given the long work days, he said he looks for employees and interns who maintain a positive, professional attitude; avoid excessive participation in Austin’s thriving party scene; can remain productive over the course of the session; and will represent the office well. It was good advice to students who are interested in the possibility of interning during the upcoming session, and we are thankful for his time and wisdom. …or from learning more than we could have ever known to ask about how legislatures work. Griesel and Sluyter demonstrated their exemplary knowledge of both the history of Parliamentary Procedure and how the legislative process unfolds. We should also add that Mr. Griesel very generously gave us two copies of Profiles in Courage, John F. Kennedy’s Pulitzer-Prize winning biographies of US Senators. When we got back to the car with gifts and opened the book, we noticed that he had marked the chapter featuring Sam Houston. Although our morning only covered the governing portion of our dual-view day, our learning went well beyond statesmanship. From the history of the English language to the art of H.A. McArdle to the literary efforts of a former President, we left the Capitol more well-rounded than we entered. With such a productive morning, we could only speculate on what the evening would hold at our first-ever New Politics Forum Campaign Bootcamp. 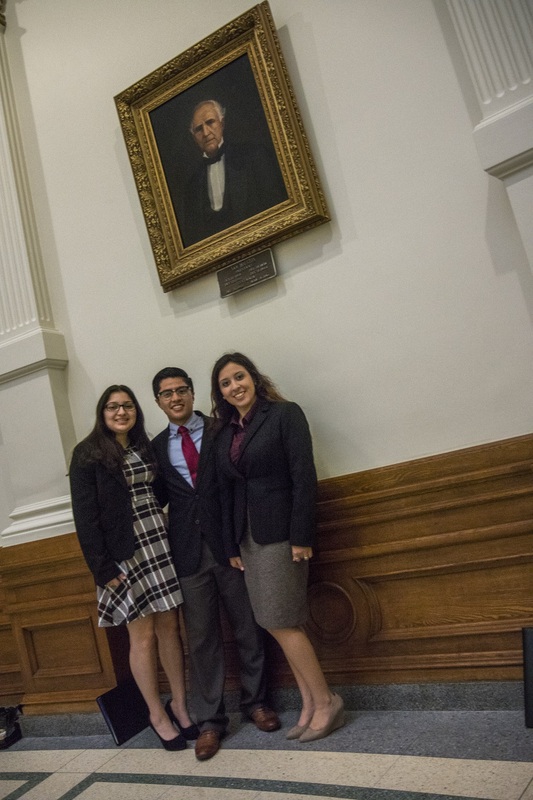 Riding through through the rain and flooded roads, LEAP Students (Brian Aldaco, Isabela Gonzales and Christina Perez) and Professor Yawn eagerly headed to a Boot Camp–a boot camp for politics, that is. Before arriving at this campus for campaigning, however, we decided it was time to treat our palates with dinner at Southside Market and BBQ in the city of Elgin. We enjoyed a plate of ribs, brisket, and the signature beef sausage (considered “the best around” ), complemented by the restaurant’s homemade honey mesquite bbq. After an amusing table chat and a quick sighting of the Victorian house style which served as City Hall, we resumed our route to Austin, Texas. 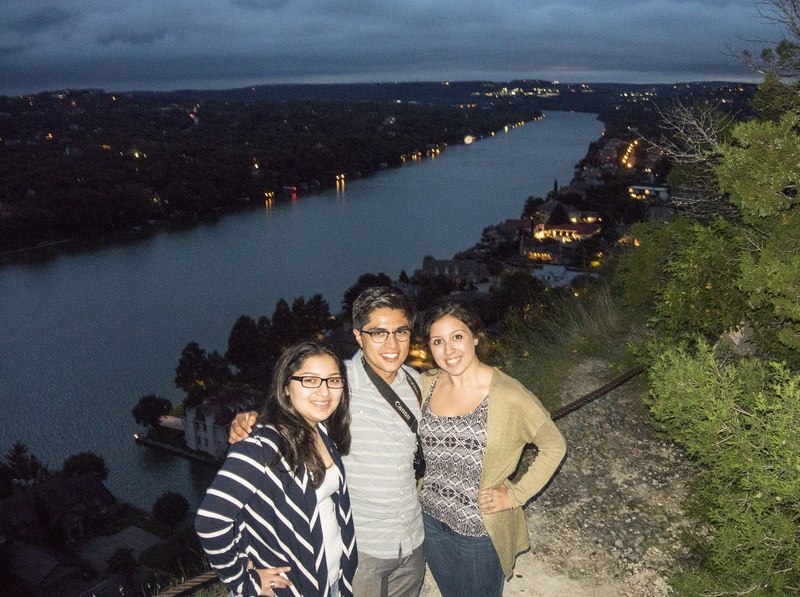 Our second pit stop landed us at Mount Bonnell, where we got to enjoy the gorgeous view of Lake Austin. We weren’t the only ones: romantic couples sat alongside the cliffs, watching the last vestiges of the sun as its rays faded over the Colorado River. Indeed, the spot is a great place for a picnic or to simply take selfies with friends. To the east, visitors see the outline of Austin’s downtown. On both sides, at least at this time of year, the surroundings are lit by the flashes of fireflies–and, on this night, actual lightning! We recommend that everyone visit Mount Bonnell at least once. …and taking an obligatory photo alongside Elizabet Ney’s Sam Houston. Over all we enjoyed the coffee shop styled bakery with its colorful walls and trendy appearance. With our bellies stuffed we headed to the hotel in order to rest and prepare for tomorrow’s busy itinerary.